With whipping wind, sideways-falling snow and ice slicks on every block, it’s been important to keep in mind that there will be life after winter. In New York, that also means remembering a tidier time – before sidewalks were hedged with diminutive mount trashmores (complete with Christmas tree husks) covered in snow, ice and slush. Right now a little bit of sunshine goes a long way, blue sky days are that much better and best of all is when the forecast calls for a chance to leave the house in something other than clunky snow boots. So I’m even more appreciate than ever of the friends who preserved, canned and bottled summer’s sweetness and shared it with us. 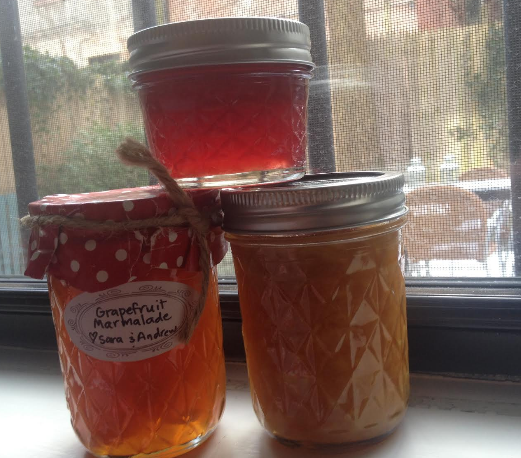 Our pantry is stocked with bright marmalades and dark fruit jellies that give us hope for the possibility of budding trees, picnics in the park and far less trash on the sidewalk. Here is my friend Sarah’s recipe for her red currant jelly so you can have your own spot of brightness on a cold day. We’ve been slathering it on toast and mixing it into plain yogurt. Place the currants in a large pot, add the water (about 1/4-1/2 cup) and sugar (1 cup + to taste, some people so equal parts but I like it more tart than sweet). Cook over medium heat. The currants will start to release all their juice and pop out of their skins. Once you have a more liquified consistency, about 20 minutes, drain the currants over a bowl. I did this using cheesecloth and the help of a mesh strainer. Be careful not to squeeze the cheesecloth or you’ll get more of a cloudy jelly. Once all the liquid has been drained, you can pour into canning jars and process in a water bath (water bath canning instructions here). This entry was posted in create and tagged building castles in the air, canning, cooking, housewarming gift, red currant jelly, Sarah Takenaga by lhouse. Bookmark the permalink.